"Today I speak to a nation in grief," Trump said . 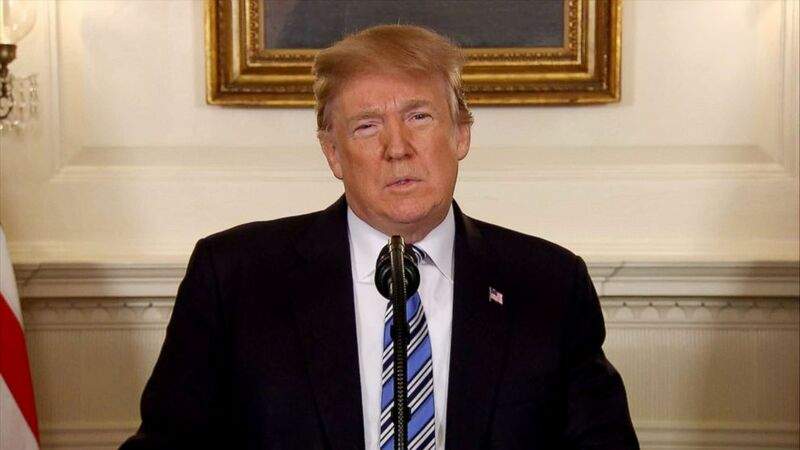 President Donald Trump addressed the nation from the White House following a deadly school shooting in Parkland, Florida that left 17 people dead and 14 injured. "Today I speak to a nation in grief. Yesterday a school filled with innocent children and caring teachers became the scene of terrible violence, hatred, and evil," Trump said. As consoler-in-chief, a role that has become all too familiar for modern presidents, Trump addressed a nation that has seen three of the deadliest mass shootings in the past year. This is the fourth time the president has spoken to the country in the aftermath of a shooting. "Our entire nation with one heavy heart is praying for the victims and their families. To every parent, teacher and child who is hurting so badly, we are here for you, whatever you need, whatever we can do to ease your pain. We are all joined together as one American family. And your suffering is our burden also," he said. Standing in the Diplomatic Room of the White House, Trump also sought to console the parents of the young people who died in the attack at Marjory Stoneman Douglas High School. A former high school student opened fire on students and teachers using an AR-15 rifle. "No parent should ever have to fear for their sons and daughters when they kiss them goodbye in the morning," Trump said. "Each person who was stolen from us yesterday had a full life ahead of them. A life filled with wondrous beauty and unlimited potential and promise. Each one had dreams to pursue, love to give and talents to share with the world." Trump directly addressed America's children during his remarks, telling them that they "are never alone." 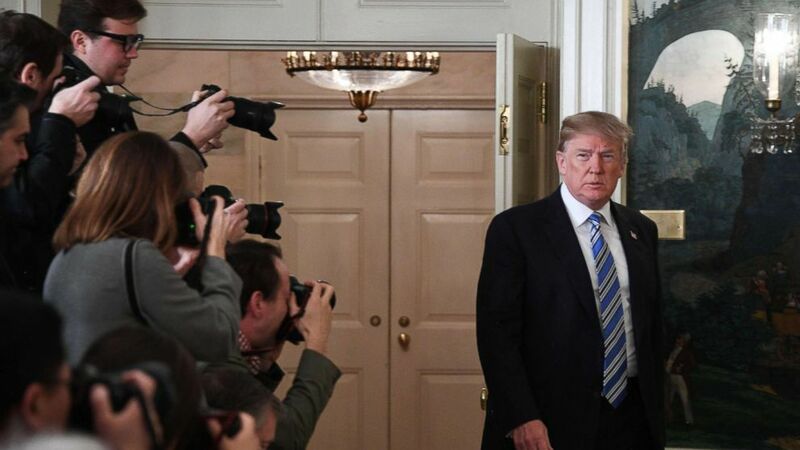 (Jim Watson/AFP/Getty Images) President Donald Trump arrives to speak on the Florida school shooting, in the Diplomatic Reception Room of the White House, Feb. 15, 2018 in Washington, D.C. "Our nation grieves with those who have lost loved ones in the shooting at the Marjory Stoneman Douglas High School in Parkland, Florida," he said. "You have people who care about you, who love you, and who will do anything at all to protect you. If you need help, turn to a teacher, a family member, a local police officer or a faith leader," Trump said. "Answer hate with love. Answer cruelty with kindness. We must also work together to create a culture in our country that embraces the dignity of life that creates deep and meaningful human connections and that turns classmates and colleagues into friends and neighbors." Trump has addressed the nation three times before in the wake of mass shootings — first, after the Congressional baseball shooting in Alexandria, Virginia that left Majority Whip Steve Scalise of Louisiana in critical condition, then, in October, after the worst mass shooting in American history in Las Vegas, Nevada, and in November, after the church shooting in Sutherland Springs, Texas. On Thursday, Trump said that he plans to work with his administration on securing schools and tackling the issue of mental health. (ABC News) President Donald Trump speaks at a press conference, Feb. 15, 2018. In a proclamation, Trump ordered all flags to fly at half-staff "as a mark of solemn respect for the victims of the terrible act." Trump said that soon after the shooting, he spoke with Florida Gov. Rick Scott, Pam Bondi, the Attorney General of Florida, and Broward County Florida Sheriff Scott Israel. The president said he plans to visit Parkland to visit families and work on coordinating a federal response to the attack. Trump tweeted his condolences on Wednesday as the shooting unfolded. The president did not directly mention the debate over gun policy reform in his roughly six minute long speech. He also did not answer a reporter's shouted question "Why does this keep happening in America? Will you do something about guns?" As he has previously in the debate over how to prevent further mass shootings, the president largely focused on the issue of mental health. On Thursday, he pointed to the shooter's history of mental illness in a tweet. Former President Barack Obama, who during his tenure in office frequently expressed frustration over the lack of meaningful gun policy reform, tweeted that the most recent school shooting is another example of why action is needed. In his remarks, Trump seemed to direct his message squarely at those who have immediately called for restrictions on gun ownership in the wake of the shooting.